I printed some shirts today. 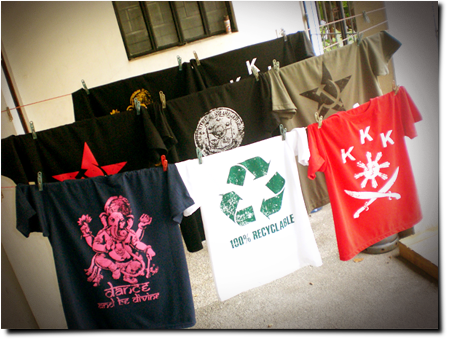 It's nice to see different shirt designs hanging on my drying line. After posting my shirts online early this month, I got a total order of 15 shirts. Not bad huh? Most of the orders are by very supportive friends, buying more than just one shirt. Other customers are from outside the Metro, like Quezon and Zamboanga. I also got some inquiries from re-sellers. I guess simple, single-color printed shirts really has its own appeal. This is all very inspiring. I really wish I could produce new screen printed designs in a snap!